Thank you for following our live coverage of the aftermath of Mexico's worst earthquake in over 30 years. At time of writing, Mexican officials are still searching through collapsed buildings, including one school where an eight-year-old girl named Frida has been spotted by rescuers. The Mexican government has confirmed that 255 people have died around the country, and at least 38 buildings collapsed on Mexico City during Tuesday's quake. As the sun sets on Mexico City, the country's foreign minister tells BBC News at the UN General Assembly meeting in New York that "the world is embracing Mexico". For all the latest updates, go to our main story here. Speaking to the BBC at the UN General Assembly in New York, Mexico's Foreign Minister Luis Videgaray Caso says his country is overwhelmed by the international response to the quake. The El Universal daily newspaper reports that the eight-year-old girl detected under the rubble of her school is named Frida. She was discovered trapped in a space only "45cm high" (17.5in). Rescuers also tell El Universal their thermal detection equipment may have also picked up signs of life in other parts of the building. They believe there may be three other people trapped alive inside the collapsed building. 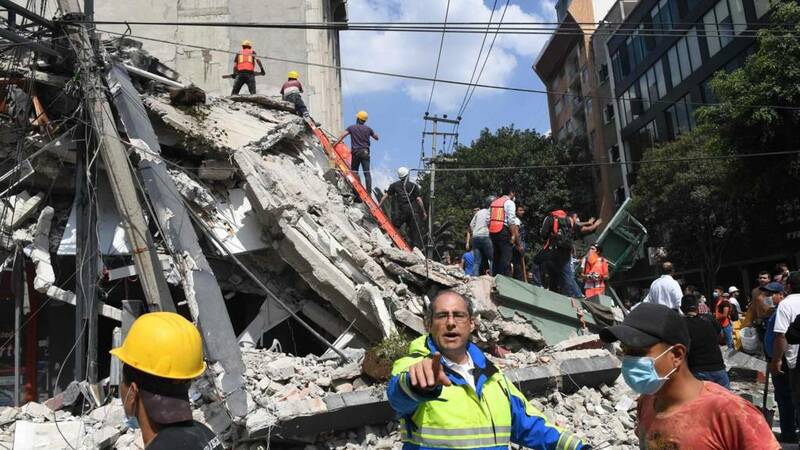 The Israeli Defence Forces have sent 70 soldiers, including building engineers, to Mexico City to help with structural assessments. In the heat and humidity of Mexico City, there's also hope. Police officers guard a six-storey office and residential building in the bohemian La Condesa neighbourhood. The concrete structure has been flattened to a towering mass of bricks and twisted metal. The damage is so severe I have to look at the building next door, which remains intact, to get an idea of its neighbour's pre-quake state. Moments later a team of rescuers in blue overalls and red hats strap head torches on as they prepare to enter the building. More than 50 people have been rescued in this city so far. People here are determined to make sure the number of those saved outpaces the death toll. As is often the case in the wake of a devastating natural disaster, people are also displaying resilience. Hundreds of people are wandering the streets holding handwritten signs that offer water and food to people. A man also holds a sign that says "no smoking". The earthquake has also led to many gas leaks and that, as well as the fear of further aftershocks, remains a concern here. The BBC's Rajini Vaidyanathan sends us this report from Mexico City in front of an apartment block that became a tomb for 20 residents when it collapsed. Dario Brooks from BBC Mundo says that authorities south of Mexico City are also warning of possible gas leaks. The BBC's Rajni Vaidyanathan and Ashley Semler are reporting that rescue crews nearby are preparing to enter a building where they believe people are still trapped. The official Twitter account of the Mexican federal police has just tweeted images of their patrolmen who are working with rescuers to save as many people trapped and injured as possible. They have also just sent these images of flying "air hospitals" transporting critically wounded people to emergency rooms around the country. Mexican President Enrique Pena Nieto, declaring "every minute counts to save lives", said his government's immediate priority was to rescue those trapped in collapsed buildings and tend to those who have been injured. "My gratitude and recognition to the thousands of volunteers and public servants who are participating in the rescue work," the Mexican leader wrote on his @EPN account. The priority continues to be rescuing people in collapsed structures and looking after the injured, he added. He also said he was grateful for "the expressions of solidarity and support from friendly nations". Mexican civil protection authorities said 225 people had been reported killed so far in the 7.1 magnitude earthquake, which wrecked and destroyed dozens of buildings in Mexico City and in five Mexican states. Rescuers at the scene of a collapsed school are asking for silence, as they listen for sounds below the rubble. The BBC's Rajini Vaidyanathan is in Mexico City, where officials have described how 38 buildings were toppled in that area. Fifty-two people have been rescued so far in the city. But more than 200 people are thought to have died in the 7.1 magnitude earthquake. Our correspondent says scores of volunteers have been handing out water, and assisting in rescue operations. "That really is the resilience that we often see in the wake of these devastating natural disasters," she adds. The earthquake isn't stopping some people from trying to continue as normal.The BBC's Rajini Vaidyanathan has arrived in Mexico City, and shared this image of a damaged car that's still on the road. The BBC's Aleem Maqbool is at the collapsed primary school in Mexico City which he says is "the symbol of so much loss" following the earthquake. He said rescuers believe there could be an entire class of children, along with their teachers, trapped inside the school, which is in the city's southern Coapa district. The BBC's Juan Paullier is at a collapsed primary school in Mexico City where at least 21 children and four adults have died. He says people trapped under the rubble have been sending text messages to their relatives. More than 500 members of the army and navy, along with 200 police officers and volunteers, have been working at the site, Mexican newspaper Milenio says. "Some voices have been heard," Mexican President Enrique Peña Nieto said after visiting the rescue operation. "In the time I have been here, I have seen how at times they have asked for total silence, solidarity to listen for the voices." A video shared by the Mexican President's office shows volunteers and military personnel carrying supplies at the Campo Marte venue in Mexico City. Hundreds of volunteers have joined the emergency services to assist with relief efforts. US President Donald Trump had " a lengthy call" with Mexican President Enrique Pena Nieto following the earthquake, the White House has said. Spokeswoman Sarah Sanders gave no other details about the conversation. Yesterday, President Trump tweeted: "God bless the people of Mexico City. We are with you and will be there for you." Politicians in the US have been sending a steady stream of messages to their neighbours across the border. Some buildings are still standing - is it down to architecture or geology? A strong earthquake has struck central Mexico, killing more than 220 people and toppling dozens of buildings in the capital, Mexico City. Two big earthquakes hit Mexico within 12 days - are they connected? Video shows buildings toppled fire in Mexico City. Buildings have been evacuated in the capital, Mexico City, after a strong earthquake. In Italy, quake predictions from self-taught forecasters have people on edge. But is it possible to pinpoint when a quake will strike?